The Liberation is a 2-VCO monophonic synth with a polyphonic section that can play simple organ-type sounds. 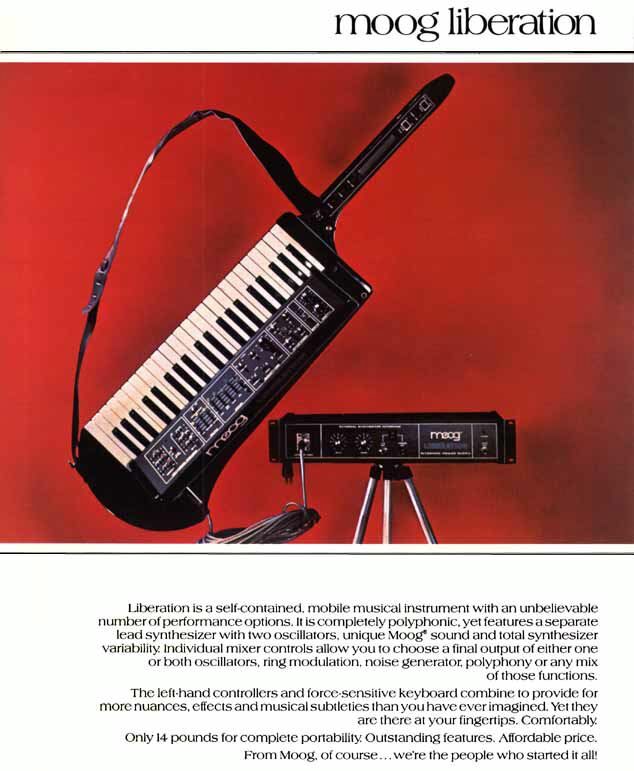 Its keyboard is aftertouch-sensitive and on its neck it has control wheels for filter cutoff (spring loaded), modulation and volume, as well as a pitch ribbon. VCO1 is switchable between triangle, sawtooth, and pulse wave. VCO2 has triangle, sawtooth, and square waves and can be synced to VCO1. Both oscillators can be switched over a 3-octave range. However, VCO2's range is an octave higher than VCO1's. The Liberation has a single VCF and 2 ADS envelopes: one for the VCF and one for the VCA. There is a 40-foot cable that connects the Liberation to its rackmounted other half which houses its power supply and cv/trigger output sockets.